We recently finished up training 20 dogs sent to us from Dubai, United Arab Emirates. 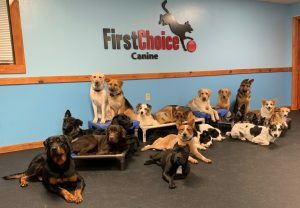 These 20 dogs, mostly rescues, were guests of ours for 8 weeks while completing our Super Dog program. Our Super Dog Program is the best dog training available in New England! Our Super Dog Program is fully customized and offers the best dog training available customized to the individual dog and owner. For these dogs we started with the basics and teaching them the concepts for on leash obedience. From there we trained them in off-leash obedience training and added in training for tricks! Each and every dog was trained for off-leash obedience and each learned different tricks depending on their abilities. Once we finished up their obedience it was time to take it a step further! We began working the dogs in groups with 4-6 dogs heeling besides us and going to their place command together. Performing synchronized obedience and tricks is more of a challenge than doing it alone! We taught an array of tricks including sit pretty, play dead, roll over, spin, and some dogs, including Shiba and Arya even learned to give each other hugs! It was an honor working with them, and an honor training them for someone who cared so much to send them here to us to ensure they have better lives ahead! Check out these super cool pups, graduates of Super Dog Program! Flash (Rottweiler), Cesar (Chocolate Lab) Midnight(Black Lab) Summer (German Shepherd) Khaleesi (German Shepherd) Breeze (Yellow Lab) Snow (Aussie) Big Doy (German Shepherd) Red (Australian Cattle Dog) Knight (Staffordshire Terrier) Panda (Border Collie), Starlight (BorderCollie), Polo (Mix), Talia (jack russell mix), Duchees (Corgi), Arya and Shiba (Australian Cattle Dogs), Small Doy (German Shepherd), Rigby (lab), and Captain(Yellow Lab). Labrador Retrievers, Border Collies, German Shepherds, and more, all trained for on and off-leash obedience and tricks!